For inclusion in the 2019-2020 Course Schedule or Catalog, proposals were due to the Curriculum Committee by November 12, 2018. All proposed curricular changes must follow the procedures outlined in the A&S governance documents. 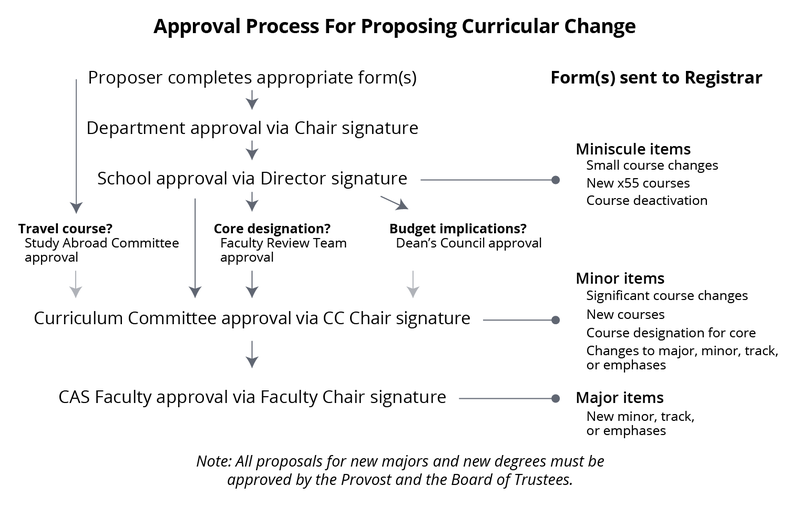 The diagram on this page illustrates the approval process, as well as the approval level required for major, minor or miniscule changes within the curriculum (click the image for an enlarged version). Forms for proposing different types of curricular change can be found in the table below. Please download the appropriate form to your computer, open it in Adobe Acrobat Reader or MS Word, fill in the appropriate fields and save it with a new file name indicating the course or program being modified. Forward the completed form to your department chair and then to your school director. You can not fill out the forms if you are viewing them in your web browser. When proposing new courses or course changes, it may be useful to examine the guidelines for course levels. Other curriculum committee policies can be found here. In constructing new majors or modifying existing ones, it may be helpful to look at our database of required credits for all majors. If you are proposing a course that will fulfill the college's Writing in the Discipline (WiD) core requirement or seeking to designate an existing course as a WiD course for your program, please review the summary of WiD practices and learning outcomes at Pacific. As of 2019, the Curriculum Committee prefers that you use the Word (.docx) versions of the curricular change forms, however the forms are also available in PDF format in Box.